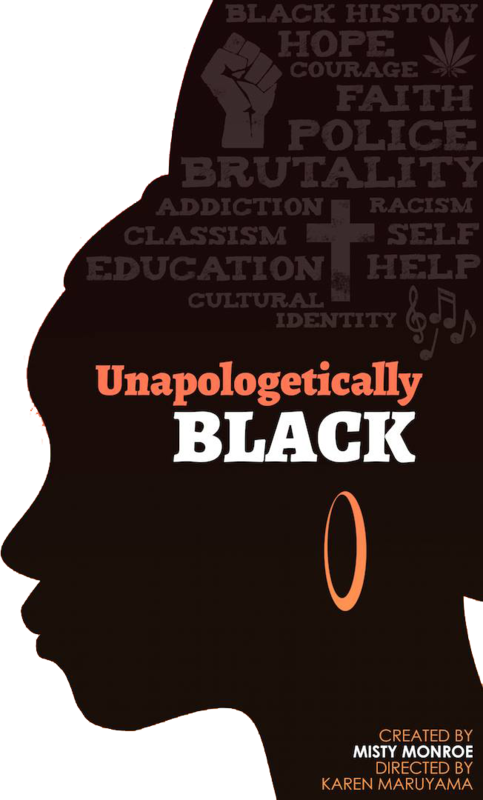 “Unapologetically Black” blends my two favorite worlds: Theatre and Education. The show reveals how I progressed through the “Stages of Nigrescence” to achieve a healthy Black identity, which was especially challenging for me as a Black child growing up in both white suburban neighborhoods, and drug-riddled areas of South Central Los Angeles. I’ll share my own family’s painful struggles with drug addiction and how I was able to achieve my goals in spite of it. This show is incredible and full of heart. The piece is structured perfectly. It’s educational, engaging and relatable to people of all stripes. But what really makes this show work is Misty Monroe Clark. She’s an amazing actress who guides you through a touching story with brilliantly delivered humor, while somehow engaging the most painful moments of her life. Her bravery will leave you speechless!! If you have a chance, GO SEE IT!!! Misty experiences every emotion in this show, and with her engaging and charming performance, the audience does the same. I laughed, cried, felt the breath knocked out of me, and left the theatre feeling educated. Go see this show and learn about an amazing woman’s life and her struggles in finding identity. One of the best solo shows I’ve ever seen. I laughed. I cried. And then i laughed and cried again. It was one of the most honest performances i have ever scene. I felt like i was right there with her. Misty is a charming and endearing presence onstage. She theatricalizes her story while staying natural. I feel like I could be hanging out in her living room hearing this story with a glass of wine. I laughed, I was genuinely moved, and I learned a lot. Misty is vulnerable, sharing the most profound moments of her life with us, while keeping us laughing with relatable missteps along the way. Have a comment or question about the show? Let’s hear it! James! Thank you so much for taking the time to send these kind words, they really encourage me. What a marvel! Misty delivers a dynamic educational performance that empowers one to succeed in life no matter what the obstacles! It resonated with my soul!!!!! What a beautiful story!!!!!!! Should be shared all over the world….Misty thank you for your wonderful talent, beauty, and charisma on stage!!!!! Want to book Unapologetically Black for your event or venue? Please send a message with the details. Want to book Unapologetically Black for your event or venue? Please send me a message with the details.